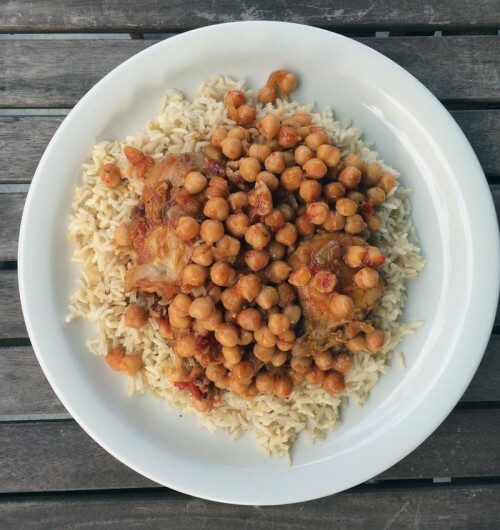 I made this dish back in early summer when the weather was hot, but not too hot, that turning on the stove seemed like No Big Deal. Then, as luck would have it, this west coast summer turned HOTTT and making salads as dinner became de rigueur. Now that it’s already late August (whoever called it the King of Months is a big fat liar), the weather has become a bit cooler, so turning on the oven is a happening thing once again. Thank goodness because this dish is a winner. I used chicken thighs but legs would be good here too. I’d skip the breast meat and save that for another kind of dish – breast meat has no place here. Bone-in and dark meat are a must, I think. 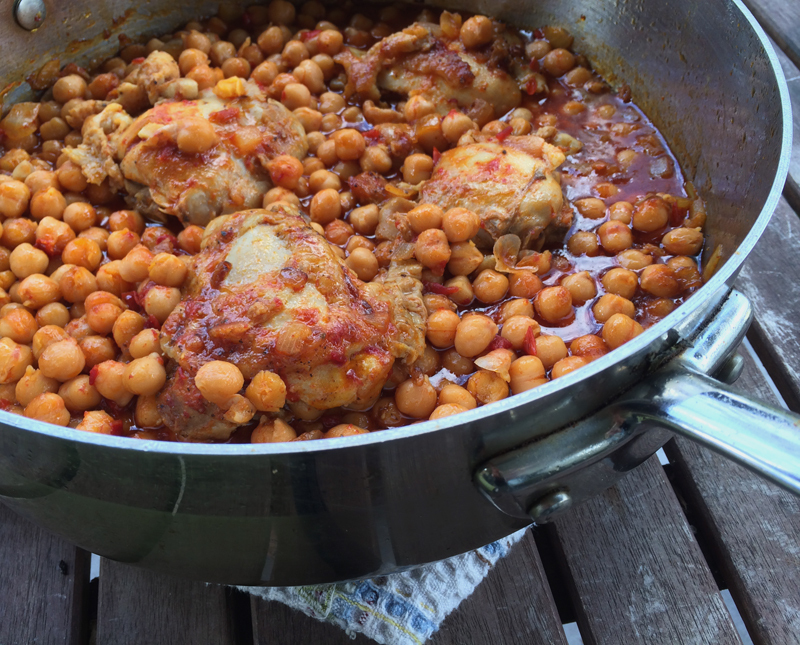 The chicken thighs, along with the chickpeas get bathed in a sauce full of flavour. And that flavour is harissa, a spice that I’ve never really used before, but I have more plans for it because I liked it so much here. 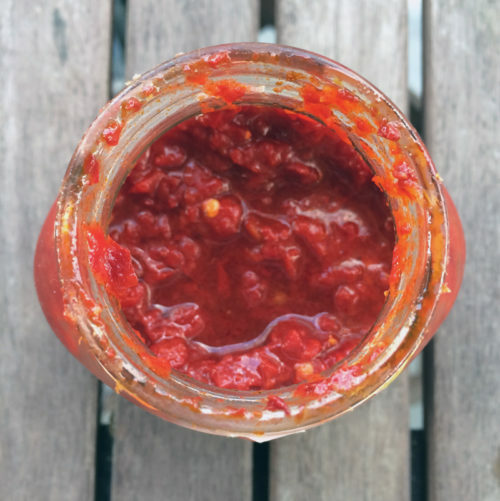 Harissa is an African spice blend with an earthy flavour and a bit of a kick. Mine came in a tiny glass jar from a fancy food shop, but you can find it in tubes and cans too! It’s heady with cumin (at least my version was) for that earthiness and an assortment of hot peppers. My version wasn’t super spicy but I’d advise in giving it a taste before you add it all in. To add some much needed brightness to this dish, some lemon gets squeezed overtop before serving. Please give this dish a try! Have you used harissa before? 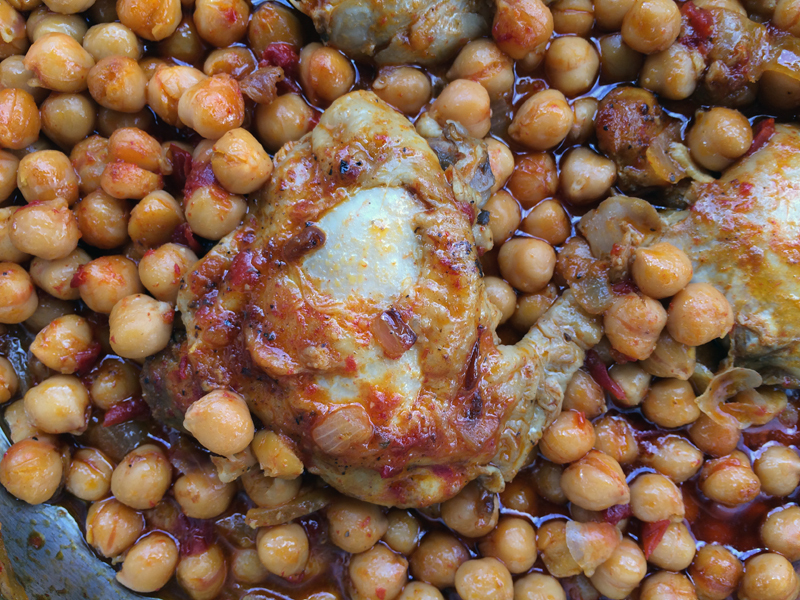 If so, please comment and include a favourite recipe as I’d love to expand my harissa horizons. Give your harissa paste a taste before you start cooking, as the heat can vary depending on the blend. Season chicken with salt and pepper. Heat oil in a large oven-proof skillet over medium-high heat and brown both sides of the chicken, 5 minutes per side. Transfer chicken to a plate and pour off all but 1 tablespoon of fat. Add in the garlic and onion and cook until fragrant and soft, about 5 minutes. Add in tomato paste, chickpeas, harissa and broth, stirring well and bring to a simmer. Add in the chicken, skin side up and pop pan into the oven. Roast until the chicken is cooked through, 20-25 minutes. Remove from oven, squeeze lemon over top and serve. I just bought Harissa paste and didn’t know what I was going to do with it. This looks marvelous and I think may solve my Harissa paste problem! Thanks! 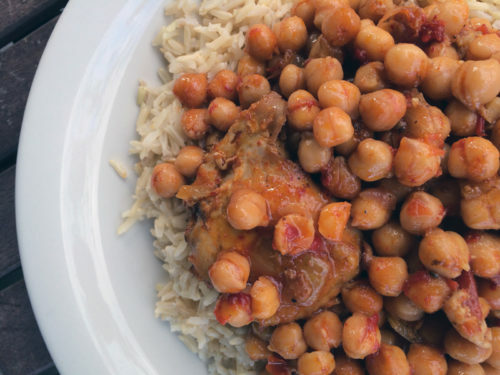 This looks like a wonderfully warming dish as the temperature starts to drop. It’s getting chilly in the UK too. I haven’t cooked with harissa that much myself but my husband went through a phase of putting it on everything he grilled and it was delicious. I need to give it another try. My husband frequently makes Ottolenghi’s recipe for shakshuka (in the cookbook Jerusalem) which includes harissa as an ingredient. That cookbook even has a recipe to make your own harissa. This sounds fantastic. Harissa is great! Thanks for the awesome recipe; I’m going to have to try it sometime. What a wonderful dish, love harissa…..it is such a flavorful spice. Oh yes! I’m so glad you made this. (I have pinned the recipe on Pinterest.) Everything about this dish screams “eat me!” It looks delicious!!! I have a powdered from of harissa that I found in Athens, GR on my last trip, but I have also used a paste version in a tube in the past. My first foray with using harissa was making a Moroccan chickpea stew with root veggies like carrots and sweet potato, and adding a motley of warming spices like, cinnamon, cumin, ginger, cayenne and harissa. Just perfect for a cold, rainy day in the fall. This carrot saladh ttp://smittenkitchen.com/blog/2010/05/carrot-salad-with-harissa-feta-and-mint/ is amazing..I hope you try it! Thank you for the reci it looks delicious and is on our menu for dinner later this week…looking forward to it! Caz, I’m going to try grilling with it. Great tip!! It’s a total “eat me” dish, Joanne, I’m sure you’ll love it. Like the idea of adding to a vegetable stew. I did try making just a veggie version of this dish, but it didn’t turn out as good without the chicken. Maybe adding other spices is key!! Kim, yes, I’ve bookmarked that recipe. Thanks for the reminder! Hope you love this dish as much as we did. Since then, I’ve mixed it into tomato sauces often. Thanks for adding another reason for me to own the jar! kickpleat, Maybe if you make the veggie stew thick and tomatoey and add more spices, you won’t miss having the chicken. Thanks Kate, I’ll definitely be trying eggs & harissa soon! Yes, JoanneM, I think it needed more spice and more vegetables. My pantry was bare at the time so it wasn’t the most successful experiment! I made this on the weekend and added some swiss chard and tomato puree instead of the chicken stock – AMAZING! Served it over rice – perfect fall chicken dish. Caterina, so glad you enjoyed this! !